David Lively, whose 50th high school reunion is in June, was the kid who played school all summer using his old workbooks. 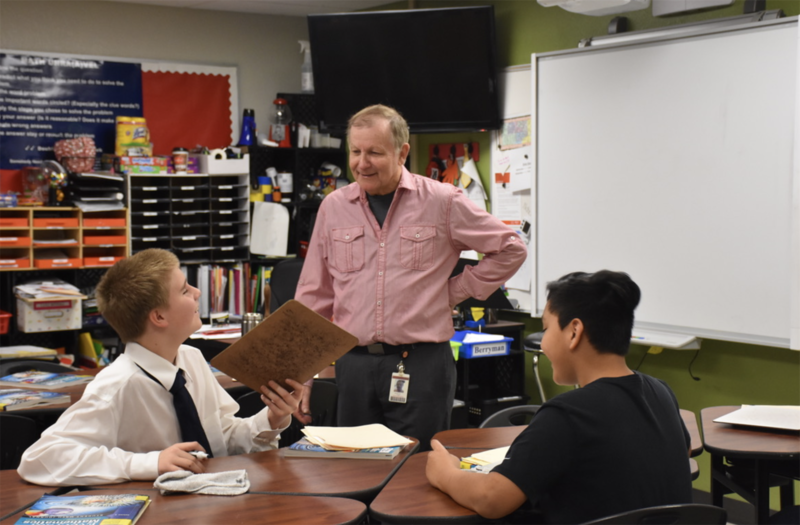 Over the course of his career, he’s taught multiple grades, been a principal, retired from teaching once and was named this year’s Teacher of the Year for Horizon Intermediate. There was never a question about what he would do with his life except that one time in college when he made assistant manager at a TG&Y store. It seemed like a reasonable idea to quit school and make great money full time. He celebrated with his first new car, a bronze Chevy Malibu with a black vinyl top. He quit TG&Y to do his student teaching. Thanks to his father making the car payments, he got to keep the Malibu. When he graduated, Lively went to a private Bible college in Missouri where he met his wife of 40 years who was also from the Oklahoma panhandle. They moved back to Oklahoma where Lively got his first teaching job at the consolidated Sharon-Mutual district teaching third grade. He taught third, fifth and sixth grade before becoming the principal for a couple of years. His career for the next 30 years took him back and forth between Missouri, with the landscape they loved, and Oklahoma, to be close to their families. In 2010 he retired from Joplin Public Schools in Missouri. Then, they moved back to Oklahoma the final time. They didn’t have a choice really; their grandchildren were here. Lively’s grandson was in the Mustang district and Lively started substituting. When a special ed teacher had to quit for health reasons the last nine weeks of the year, Lively took over. “I thought, ‘Man this is fun,’” he said. He taught fifth grade at Mustang Elementary one year, went back to substituting and then was a teacher’s assistant. He was standing outside as he did every morning, greeting the kids as they arrived for the day, when he was approached by Holly McKinney, principal of Horizon Intermediate. He loved working with McKinney, loved her positive attitude. The next thing he knew, he was a math teacher at Horizon. Lively has simple rules for his classroom: Don’t overthink math; have fun; and his classroom is a haven. He tells them he’s there if they ever need to talk. He encourages them to talk to any teacher if they have problems, that they don’t have to go through it alone although a lot of them do. Lively loves working with fifth graders. They’re still eager to learn and not too grown up, he said. They appreciate it when he dresses up as Elvis, or as an elf at Christmas and he manages to convince other teachers to dress up with him. For the 2016 Relay for Life, Lively, in a sequined ball gown and heels, won Queen of the Relay for the Horizon team. “When you have people that are so supportive, they can get me to do anything for a good cause,” he said. Lively has been teaching at Horizon for three years. Lively will be competing with 13 other site teachers of the year for the title of District Teacher of the Year. The winner will be announced at a special banquet in March.